Istartpage123.com is the newsiest addition to a long linage of browser hijackers owned by Turing Tech Inc. You should remove this hijacker, because it is unasked-for, unreliable, and can compromise your computer’s security. The purpose of this hijacker is to modify your browser’s settings and impose a new search provider and homepage on it. Istartpage123.com would not fall into the category of browser hijackers if it was not for the fact that it prevents you from fixing the changes it had made. This hijacker is not just a website — it is a search engine which can perform searches, but we do not recommend using it as it is prone to feature promotional links of shady websites and commercial advertisements. There is much more to talk about this browser hijacker, and if you are looking for ways to delete it, then please continue reading. As mentioned, Istartpage123.com owned by Turing Tech Inc., but we think that this is a fake name, because we were unable to find any additional information whatsoever. It seems that this hijacker’s, use made up names to digitally sign their websites in order to give them the appearance of legitimacy. Regardless, we know that Istartpage123.com is not a legitimate search engine and the same can be said about its clones, such as Sweet-page.com, Istartpageing.com, and Mystartsearch.com. Like its clones, this new hijacker is disseminated using malicious software installers. By malicious we mean that those bundles can contain adware, spyware, and other types of mildly malicious programs. Therefore, you should avoid visiting borderline-legitimate software distributing websites as most of them bundle software with malicious programs in order to make money. If you are unfortunate enough to accidentally install a bundle that contains Istartpage123.com, then get ready to experience a lot of inconvenience and frustrating browsing sessions. This hijacker will automatically change the search engine and homepage of Microsoft Edge, Google Chrome, and Mozilla Firefox. Not only that, but it will also modify the shortcut Target line so that you would not be able to change the modifications it has made. Istartpage123.com is part of a large web monetization scheme that focuses of clandestine advertising techniques that include injecting promotional links to the search results. Furthermore, it must be said that all of the searches are done not by this search engine, but rather by Yahoo.com. In any case, its search results should be viewed with suspicion, because its promotions come from unknown sources that are probably partner websites. Istartpage123.com is not an immediate threat to your system’s security, but you can never be sure that this will always be the case. This program comes from a mysterious malware developer that has a history of developing browser hijackers. The fact that this search engine is set as the default homepage and search provider without your permission is outrageous. This cannot be tolerated. You should also not tolerate the fact that it modifies the browser’s target line in an effort to prevent you from deleting it. If you want to remove Istartpage123.com manually, then follow the removal guide provided below. Find the program and Remove it. Right-click on the Windows logo on the botton-right of the screen and open Control Panel. Find the unwanted application and right-click on it. Locate Manage search engines button and click it. Remove the hijacker’s search engine. Then, select or enter a new one. Then, click the Search tab. 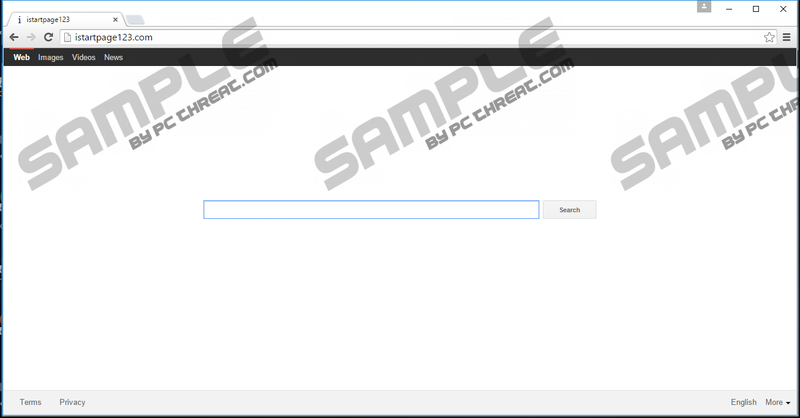 Select and remove the hijacker’s search engine. Select a new search engine. Click More actions and go to Settings. Find Open with a specific page or pages section and enter a new address. Type a new homepage address in the address bar. Opt for a new search engine in the Search in the address bar with section. Quick & tested solution for Istartpage123.com removal.